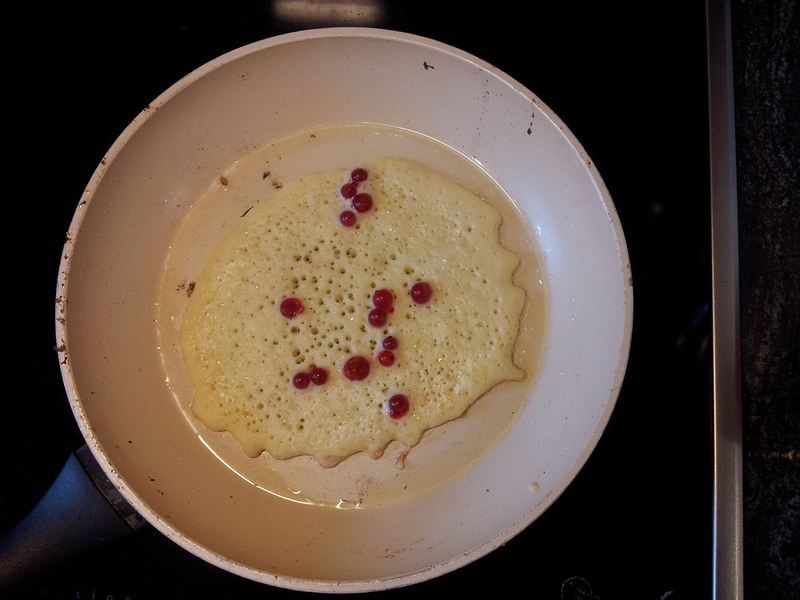 Here it was rainy again which was just the right weather for trying out another new currant recipe: Cornmeal Red Currant Pancakes. I found the recipe by Aimée at Under the High Chair blog, which was an adaptation of the Blueberry Cornmeal Pancakes in Martha Stewart Living (June 09) . The original recipe included a Red Currant Syrup which also looked delicious, but I chose to go with the easier Aunt Jemima. As I didn’t have the cornmeal it required, I decided to go with durum wheat semolina. I have no idea what the difference is, but I loved the extra flavor it gave to the pancakes. Usually I use white flour for my pancakes but I know I will be using this recipe as a base for many other fruity combinations in the future. 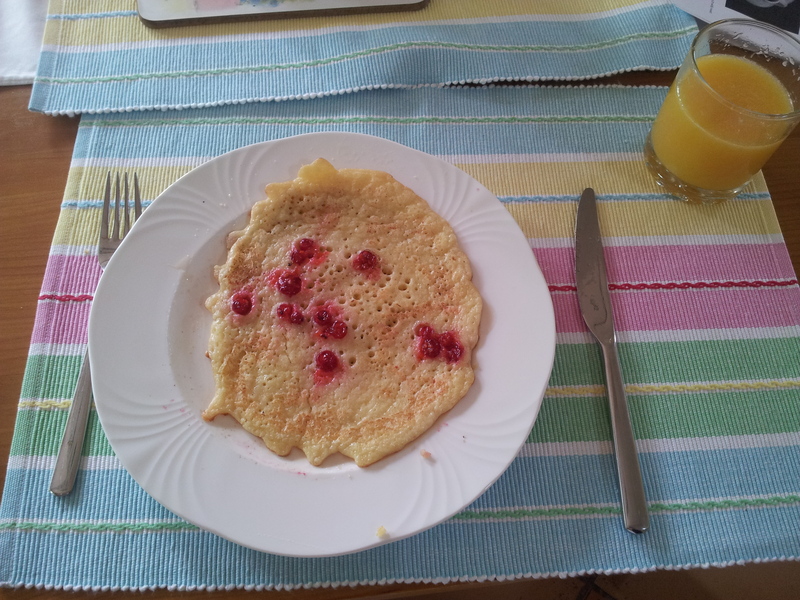 One thing I particularly liked about this recipe, is that as you drop the berries into the cooking pancakes, they don’t get squashed and turn the batter pink. However, this caused a little trouble with my frying pan, but eventually we found a solution: not flipping them until the very end. Of course, I also made some ‘plane Jane’ ones too, for a slightly picky someone, and even those were delicious. Well I hope you too will give the recipe a try! Let me know how it goes if you do! 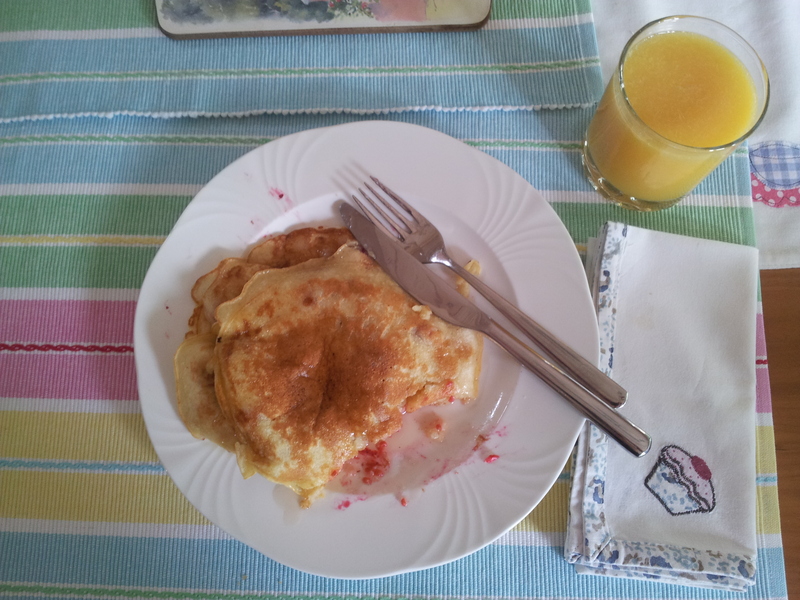 I am always on the search for the perfect pancake recipe, so please let me know if you have any you would recommend! I would love some of those. Especially compared to the leftover pizza that I’m heating up (in a frying pan because that’s the way I like it). Which is still yummy, but I miss breakfast foods. Al likes savoy things for breakfast. This summer I’ll have to indulge in some waffles and french toast when he leaves for work. I will try this out too! Love and miss you Jodie, I have Stephie this week and she sends a “big hug” to Aunty Jodie!! Hi Robyn, oh Miss Stephie is going to have some fun!! Yes I hope you do try these. You can make them with Stephie. You will have to elaborate on the “savoy things for breakfast” part. I want to hear all about your trip. Skype me!